There was a youtuber who took videos and uploaded them on youtube. His name was Jack and he had only 10 subscribers. Jack was a little sad about his lack of subscribers so he racked his brain to think of a way to attract more. So he decided to meet the best battle bot youtuber battler. Battler was famous for taking videos of robot battles. He had over 2 million subscribers from all over the world. So battler was too busy to meet Jack. Battler had to interview the controllers of the new contest that is starting a month later. Jack was very upset that he couldn't meet Battler so he came up with an idea. He called Battler and pretended to be one of the controllers for the upcoming competition. Battler agreed to meet Jack the next day. It was the next day. Jack and battler met in a restaurant. they talked about robots but battler found out there was something strange of Jack. Battler realized that Jack wasn't an actual controller. He got very upset and stormed out of the restaurant. But when Battler arrived home, he wanted to know who Jack was and how good his youtube videos were. Battler watched all of Jack's videos. At first, he thought they were horrible but there was something about the videos that intrigued him. He zoomed in and zoomed out when he needed to. His camera work was wonderful. Battler wrote a note in the comment section of one of Jack's videos. He complimented his camera work and suggested that they meet again. But Jack was still mad at Battler of storming out of the restaurant. Jack made a bet with Battler. There was a robot battle taking place that night between two of best robots in town; Terminator and Croc. They bet on the robot battle. Jack bet on Croc and Battler bet on Terminator. Terminator was a big, heavy, steel robot that had a giant hammer for smashing his opponents. Croc has a big mouth. The mouth's power was stronger than a real crocodile. No robots had returned after the battle with Croc. If Battler won the bet, Jack would have to work for him for the upcoming Battle bot Tournament and if Jack won Battler would have to stop making videos. It was the battle day. The battle field was on youtube live. When the battle started Croc was able to get Terminator in his mouth. He began to squeeze him but Terminator hit Croc with his hammer and was able to escape. They fought and fought but no robots were smashed. So Croc used his all power to use the death spin. Croc got Terminator in it's mouth and started to spin his mouth. When there was only 1 seconds left Terminator hit Croc's mouth with his hammer. The field was covered with Croc's pieces. Battler had won the bet. Jack was a little upset but, deep down, he was excited to work with Battler. At first they made a new youtube channel. It's name was Jakler. They made some short videos that were watched by millions of people. Everyone loved Jack's camera work. There was 1 week left before the tournament. They had to buy some equipment and plan for the tournament. They tested the new equipment and everything worked great. On the day of the tournament they were all set to go. There were 32 robots on the tournament. The heavy favorites were Terminator, Croc who had been rebuilt and cutter. Battler and Jack interviewed croc's controller, John. He said he was really mad at terminator and his controller and hoped to get revenge during the tournament. The tournament started.The first battle was 'Cutter' and a drone robot 'flyer'. Jack and Battler had set up all of their equipment and were ready to film the battle. The battle started. Cutter tried to hit Flyer with it's saw but Flyer flew high. For most of the battle Flyer was winning, but all of the sudden Flyer's controller lost control and Flyer fell to the ground. Cutter won the battle. Jakler thought there was something strange because, the best drone robot fell to the ground. Jackler inspected the drone and found that a wire had been cut in the radio signal that connected it to the remote control. Also, they saw a tiny "T" that had been scratched into the drone, right next to where the wire had been cut. Jackler thought it was a clue to find out who was the spy. Jackler thought there were the only ones who could find the spy. The next fight was "Tempest" vs "Domino." Tempest was a big, scary robot and it's controller was also a big, scary guy who wore all black and was covered in tattoos. The game took only 10seconds. Tempest had smashed Domino in 10seconds. Jackler noticed Tempest's controller's evil smile when he won. Domino's controller was very upset. His robot was too strong and fast to be beaten so easily. When he inspected what was left of Domino, he found a tiny "E" scratched into the sideDomino's controller told Jackler about this.Now Jackler knew who was the spy. It was Tempest's controller! Jackler told everything to the police and Tempet's controller was arrested and he was sent to jail. Everyone was happy that the cheater had been caught and the tournament resumed. The next battle was Clocky and Fire guy's battle. It was a great battle. Clocky and Fire guy were trading blows. Then in the middle of the battle there was a big explosion. Clocky was blown up. The spectators were shocked because that thought they had found the cheater. When Jack was searching the wreckage he found a small piece with an "R" scratched into it. Jackler was shocked too. 'T'and'E'and'R' meant the spy wasn't Tempest. Jack and Battler thoughts were the same. The spy was Terminator. The next battle on the schedule was Terminator vs Croc. Jackler knew that they had to warn Croc's controller before the battle began. Jackler and Croc's controller made a plan. Jackler knew that Terminator's controller would break something in croc. Jackler told Croc's controller to fix Croc right before the battle. They found that he had disconnected the mechanism that shut Croc's mouth. They also found a small "m" scratched into the side. Croc's controller and Jackler fixed Croc. Croc was ready to beat Terminator.Before the battle began they looked over at Terminator's controller. He was smirking and it was obvious that he was confident that he would win. Before the battle began they looked over at Terminator's controller. He was smirking and it was obvious that he was confident that he would win.The battle started. But no robots moved. They were frozen with nervousness. Then Terminator dashed at Croc. Terminator was being very aggressive because he thought that croc couldn't move his jaw. But when Terminator got close enough Croc bit Terminator and spun it's mouth. Terminator's controller was surprised because he thought that croc couldn't move his jaw. Now Croc was winning the game. Terminator's controller was so angry that he dashed to Croc's controller and tried to punch him. A big fight broke out between the two controllers. Terminator's controller was winning but, out of nowhere, Tempest's controller joined the fight and saved Croc's controller. People saw the whole fight on Jackler TV live. People were happy when Terminator's controller was arrested. 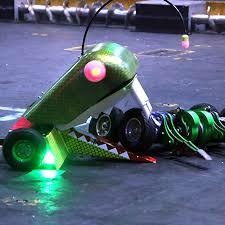 Because of the fight Jackler TV became the most popular battlebot youtube channel in the world.